I was so excited to finally decorate a place of my own, and I kind of went Pinterest crazy. Since I am a college student, I wanted furniture that was young and fun, but I didn’t want it to look like a dorm room. Most importantly, I wanted everything to be affordable, which called for a few DIY projects. Most of the furniture and decorations I bought were pretty reasonably priced from places like Big Lots, Home Goods, Ross, Marshalls, and Tj Maxx. 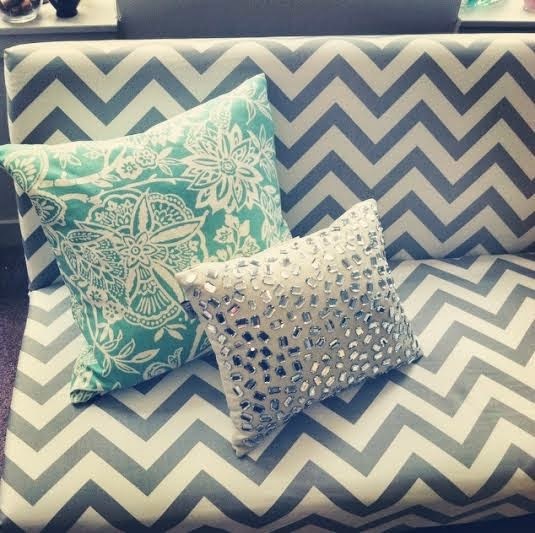 I also purchased my chevron futon from Walmart.com, where I also recently purchased more decor (which I am still waiting for in the mail). I was so surprised to see how adorable and affordable their Home section is online. I was nervous to buy a futon online before actually sitting on it, so I just went to the store and felt a similar one they carried. 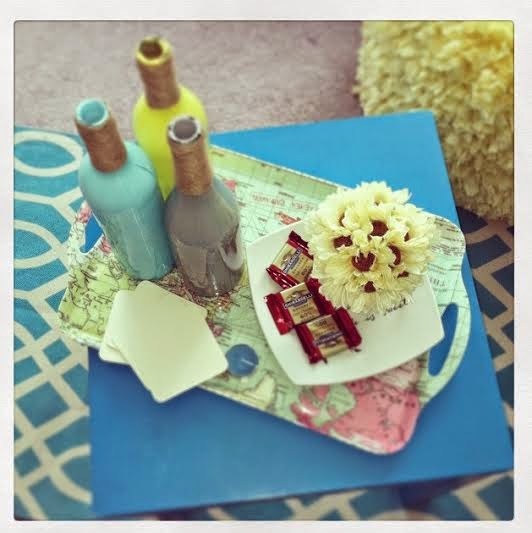 I am obsessed with trays for little tables (this was just an old table my sister had from college). I found this tray in the Kitchenware section of Home Goods for only $6.00. I also LOVE decorating wine bottles, they can make great decor (and as college student, we all know you probably have some left over wine bottles somewhere 😉 I just bought some paint from Michael’s and filled the bottles with the paint (they have mini bottles of paint for 99 cents). I also bought twine from Target for $1.00 and just wrapped it around the top of the bottle to give it a rustic look. This is just a picture of it all put together:) My mom actually found the yellow ottoman at Big Lots (on sale for $19.00). Since it’s hard to really have a “living room” in a studio apartment, I decided to use a futon as my couch, so there was a place for guests to sit and hangout, but also a place for them to sleep. It makes a great couch because it’s the perfect size, and also makes a great place to sleep because it is very comfortable and when unfolded is comparable to a full size mattress. 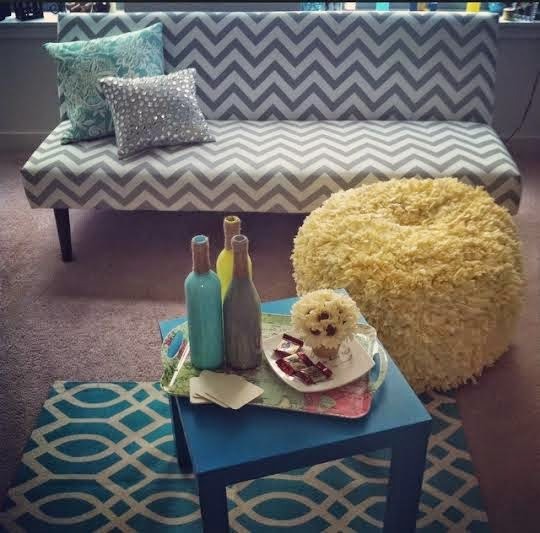 I was nervous to start mixing pattern with the futon, the throw pillow, and the rug, but I think it turned out well. I bought the little blue area rug at Home Goods (and it’s the perfect size for my little “living room” area). This is a picture of my bedroom (sorry for the Instagram editing, I don’t have the original picture anymore). I made my own canopy out of curtains, to make the room feel separated from the living room. I actually used these curtains in my last apartment, so I don’t remember exactly how much I payed for them, but I did get them off of Amazon. Hanging these up was super easy-I just poked 3 tiny holes in each curtain and hung them with command hooks, which I stuck to the ceiling (actually, my boyfriend hung them up because I couldn’t reach the ceiling). I tied each curtain together with fabric my old room mate gave me, thanks Michelle! 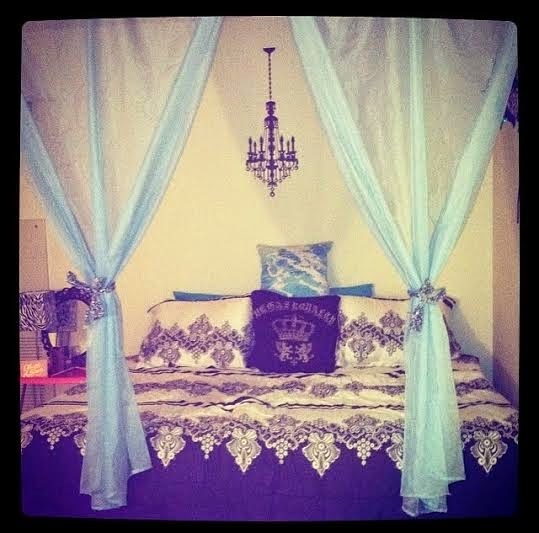 I found the bedding set at Big Lots and the chandelier wall decal was from Joann’s (they always send weekly coupons). 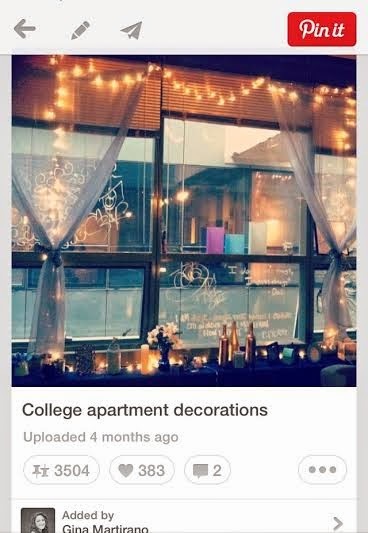 Michelle and I put our apartment on Pinterest, not thinking that it would be so popular! We actually won a Starbucks gift card from having the cutest apartment decor. Probably the most creative person I know! I remember seeing you make all these painted bottles, seeing them all turned upside down with paint dripping being like \”I wonder what she's going to do with these?\” And then to see this all put together is awesome. Can't wait to see more entries! Oh my gosh stop it I am so obsessed with your new apartment! It's straight out of a magazine, so jealous we aren't still roommates, and so proud too! I love you Gina Beana!